An ambitious plan to transform a derelict railway yard in Detroit into a boutique 36 room hotel using old shipping containers is close to being realised. The $4 million project is planned for a part of the Dequindre Cut, an old rail line in the decaying city that was has already been renovated into a bike and walking path. The ambitious plan to regenerate a large swathe of the city whose descent has signified America's industrial decline has attracted the attention of the City of Detroit who are keen to see any type of urban investment. The firm behind the project, Collision Works wants to create the 16,000 square-foot hotel near Division Street in the Michigan city to have 3,000 square feet of event space and a large outdoor courtyard. 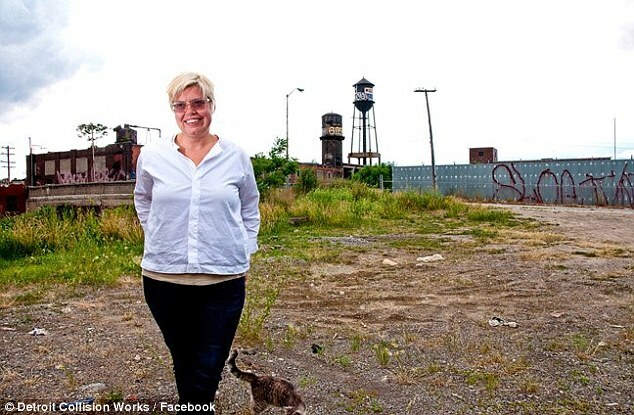 'It's a boutique hotel and community work space built around storytelling,' said Shel Kimen, founder & CEO of Collision Works, who left New York City to help transform a decrepit part of Detroit. Wanting to create a meeting space in addition to the hotel, the hotel will also have a communal working space that will be big enough to accommodate between 15-20 people. 'I came here because this city is perfect for me,' said Kimen. Kimen has traveled the world working in Chicago, San Francisco, London, Portland and New York, including stints at Saatchi and Saatchi. 'I believe business has a responsibility to contribute to the community -- that products have to be meaningful and valuable,' she said.